Trade in your bright summer shades for some rustic fall hues! If you love the look and feel of fall and want to use it to add a sense of homey charm to your living space, take a look at this guide to rustic colors. An autumnal twist can make any house feel like a home. Rustic colors make and space warm and inviting. These rustic colors will help your home feel like fall all year long. These red brown tones add a touch of earthy comfort to any space. Consider them as an accent tone or paired with muted neutral shades. Cool dark brown tones are infinitely sophisticated while evoking the natural look of wood. They can lend elegance to any space. This unusual and striking shade of yellow makes for a unique interior design element. Both antiquated and modern, this is one of the most unusual rustic colors. It is useful in spaces of any size. If you crave a sophisticated look without losing an ounce of warmth, caramel tones are a delicious fall color palette to indulge in. These soothing tones make a room feel like a well loved and truly comforting space. This bold and rich color will brighten up any home while still making a sophisticated statement. If you love oranges and reds but weren’t sure how to include them in an overall elevated look, consider this lively shade. Blue may be the go-to color for bedrooms as it promotes calm restfulness, but that doesn’t mean it has to be basic by any means. Prussian blue evokes regal elegance without overtaking a space. For the romantic and bold, consider taking red to the next level with a striking garnet shade. Turn any room into an intimate and romantic statement piece when you choose this opulent fall shade. Neutrals may have a reputation for being dull, but this warm beige is anything but uninspired. For the modern minimalist with rich tastes, this unusual beige makes an incredible statement when paired with subtle gold accents. Columbia Paint Company is happy to help you choose the perfect color for your painting project and offer you home staging tips and advice for every step of the way. 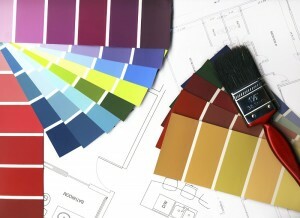 Not sure how to make sure your siding, trim, and accent colors match? Need to see the paints you loved online in person? Schedule an appointment today by calling 443-319-4001 or visiting us online. For more painting tips and updates, follow us on Facebook, Twitter, Google+, LinkedIn,Houzz,YouTube, and Pinterest!